A favorite Chicago artist whose work bowls you over for its beauty, invited me to a current show called the New UnNatural–up until March 31 at the Ukrainian Institute of Modern Art–with the hint to expect the unexpected. 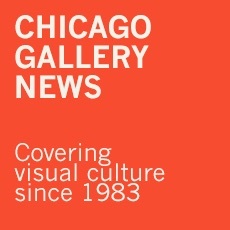 Mary Lou Zelazny, artist and School of the Art Institute professor, curated the current show with artist and art critic Robin Dluzen for which they invited artists to select works that had the power to disturb. When we met at the architecturally striking West Chicago Avenue museum in the heart of Ukrainian Village designed by Stanley Tigerman in 1978, Mary Lou and Robin were planning last-minute details for a dance performance amidst the art by Julie Potratz, one of the women artists in the show. “We asked women artists to put out there works that were a little troubling, humorous or possibly loud: hyper-real works that they might not have exhibited before. Laurie Hogin, Professor and Chair of the Studio Art Program in the School of Art and Design at the University of Illinois at Champaign-Urbana, whose works and writings have been appreciated nationally and internationally for almost 30 years, chose animal allegories. The rabbits, monkeys, birds and lizards showing human expressions are often unnerving but always hypnotic. A sneering red monkey dives into a jarring piece of red velvet cake that looks menacing but delicious at the same time. “My monkeys represent unchecked human impulses, from poor impulse control to pleasure-seeking and addiction,” she has written. Amanda Elizabeth Joseph’s paintbrush has created hyper-real paintings and drawings daring the viewer to look closely, bringing to mind “Into the World Came a Soul Named Ida, by Chicago painter Ivan Albright who left many paintings, including this haunting portrayal of aging and decay, to the Art Institute. Currently living in Columbus, Ohio, she has exhibited at several other Chicago galleries as well as at Ohio University and Notre Dame. Born in Trinidad, Renluka Maharaj is a multidisciplinary artist who exhibits her talents through performance, videos, collage and painting that deliver narratives that speak to gender, sexuality, religion and colonial history, including “They Came for the Gold”. Her works are in the collections of the Art Institute and the Museum of Contemporary Photography in Chicago and numerous public and private holdings around the country. In a video entitled “Dancing With Myself”, Julie Potratz features her dance with a floppy puppetlike replica of herself that, as Robin’s catalogue elaborates: “moves from humorous and absurd to downright creepy”. A high school art teacher on Chicago’s west side who has exhibited around the world, she explains that her work “slips between the fantastical and the everyday”. On a urethane plastic and fiberglass mask of herself, Chloe Seibert has executed a makeup makeover reminiscent of a child loose with their mom’s lipstick and other tools for the first time–but with a raw, jarring effect. Other examples in the show by the New York artist who has also exhibited in Toronto, New York and Los Angeles, extend the visceral immediacy. A native of Chicago, Maria Tomasula is much influenced by Latin street art as well as Latin colonial religious imagery. She takes art to bare bones—not to mention vital organs—in rich colonial colors. A professor of Art at Northwestern, she is a key part of the Chicago art scene. A mark of a terrific show is surely that you can’t help thinking about it, and the cleverness of the curators who brought the works together. This entry was posted in Guest Stars on March 24, 2019 by Kay Whitfield.